Grammy Award-winning musician Slash, a former guitarist of cult rock band Guns N' Roses, is in India to enthrall his fans with a two-city tour. He says he wants to do "many things", including digging into traditional Indian food. The rock icon is looking forward to his performances for MTV Indies Xtreme, organised by LIVE Viacom18, in Mumbai on Saturday, and in Bengaluru on November 14. "I’m really excited to be coming back to India! Fortunately, we’re going to be in two different locations, both of which are well known to me. But there are so many things that I’d want to do, so it’s really a matter of seeing how much we can do in the short time we have allotted. 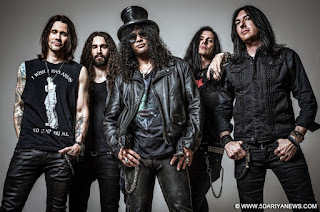 "If my memory serves me, the Indian food in India is extremely different than the westernised version in the US, so I’m interested to experience what traditional Indian food is like," Slash, who landed here early Friday morning, told IANS.Slash featuring Myles Kennedy and The Conspirators will be headlining the rock music and adventure sports festival where they will also promote their new album "World on Fire". "We’ve been trying to come to India for a few years now, and I’m really happy that we’re finally coming. MTV Indies Xtreme concerts are going to be really exciting and I can’t wait," he said.“World on Fire” highlights several important issues such as politics, war and elephant poaching among others. These universal topics are bound to speak to the audience across the world. With several socio-political issues bedevilling India, how well does he think his Indian fans would connect to the lyrics? "I think that a lot of the stuff that we’re talking about is universal. I think you could be from anywhere and appreciate where we’re coming from. Whether some of the issues that we talk about are as important as other issues that we might not have mentioned that are endemic to one particular country, is hard to say. But I think in general, anybody living on this planet, more or less can relate to some of the subjects that we have on our record," he said.Ever since its inception, rock n' roll has always been about rebellion, using music as a tool to express deeper emotions. But does he think that modern rock bands are still adhering to this motto? "The old school attitude is really about individual thinking and self-expression, and feeling strongly enough to do whatever it is you feel you want to do against all odds. As long as that spirit is around it’ll always have some of that kind of attitude, but as soon as that becomes commercially acceptable, then it ceases to have the impact it had originally," he said. 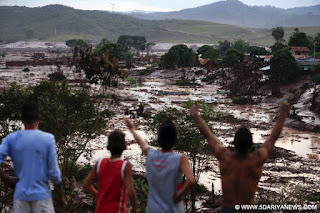 At least 15 people were killed when an iron ore tailing dam collapsed in Minas Gerais state in Brazil.The Fundao dam breached around 4.20 p.m. (local time) on Thursday and released a torrential flow of water and mud into the town of Bento Rodrigues, Xinhua news agency reported.The town was awash, buildings swamped with water and vehicles swept away, the report said.Brazil's union of iron and base metal industry workers, Metabase, gave the number of 15 people dead.According to news website G1, around 45 people were missing including 30 who were working on the dam at the time.Minas Gerais' civil defence agency, however, could not confirm the numbers. The nearest town Mariana, with a population of about 40,000 people, stands about 20 kms away from the dam.The residents of Mariana have started a collection campaign to bring food, water and medical supplies to Bento Rodrigues town.Braz Azevedo, Mariana's secretary of social defence, said the situation is very serious and there was a risk of more mudslides. The dam belongs to Samarco, a mining company, which issued a statement after the accident, saying it "could not currently confirm the cause or size of the incident. "The Brazilian Dam Committee called "the bursting of the Samarco dam could be the worst ever registered in Brazil. "Prior to this, the deadliest dam disaster in the country took place in 1986 when the Mina de Fernadinho dam broke, killing seven people.A tailings dam, serves to hold waste earth and rock after ores have been separated while also recycling the water used in processing.